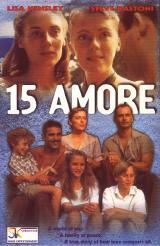 15 AMORE is a true movie of the heart, so charming that every minute you spend watching it, will be an absolute pleasure. Set in the final year of World War 2 in the Australian countryside, it depicts the story of two Italian POW's and their relationships with the uniquely different women that cross their paths. 15 AMORE will have laughing, cheering and will leave you infatuated.